At Shping, we are very community minded. We have listened to comments from a cross section of the community and, in particular, we wish to address your concerns about the potential influence that high-volume token holders may have on the value of Shping Coin once the Token Sale is complete. To alleviate these concerns, we have decided to introduce a voluntary 6-month vesting period for new token purchases for buyers who plan to acquire 1 million or more Shping Coins during the Token Sale. This in effect will ensure that a percentage of tokens that have been purchased during the Token Sale will be locked for at least 6 months after the Token Sale has concluded. As an incentive for buyers to accept the 6 month vesting period conditions, we will be offering a generous, new bonus enabling purchasers who are buying or have acquired 1 million or more SHPING to receive a 25% Bonus + Platinum Status for Life on new purchases! We understand that a 6-month vesting period for purchased tokens takes commitment. Therefore, we will be offering a generous 25% Bonus and Platinum Status for Life to purchasers who wish to accept these conditions on new purchases. What if I’m contributing less than 1 Million SHPING? If you are contributing less than 1 million SHPING, you will still have access to a range of bonuses from Day 1 through to the end of the Crowdsale, including the opportunity to acquire Platinum Status for Life for meeting minimum purchase conditions. Remember, this will be the only time this status will ever be offered. What does this mean for Presale Token Buyers? Presale token buyers who have already enjoyed significant bonuses are unaffected by the change. 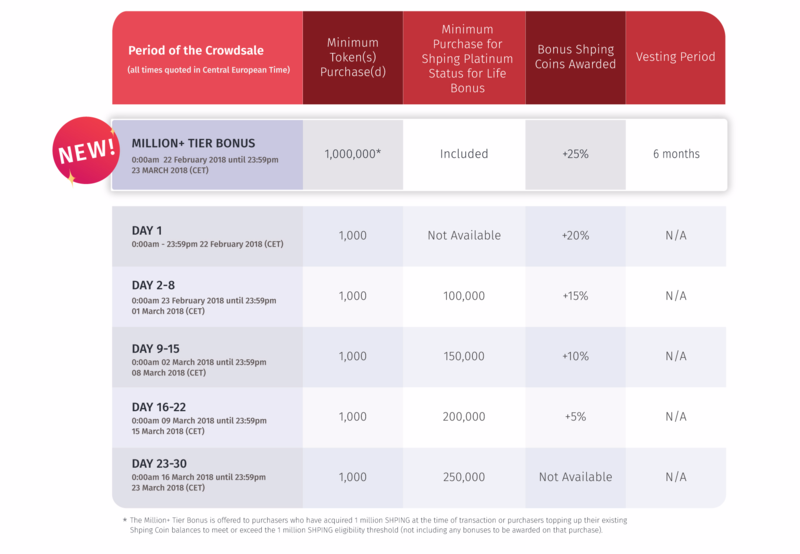 However, if they have already accumulated over 1 million SHPING during the Presale, or, if they wish to make a further purchase that tips them over the 1 million SHPING ownership threshold, they will also be eligible for the Million+ Tier Bonus during the Crowdsale. I purchased over 1 million SHPING in the Presale. Do I qualify for the Million+ Tier Bonus if I buy more coins during the Crowdsale? Yes! If you have accumulated over 1 million SHPING already, you will automatically be eligible for the Million+ Tier Bonus during the Crowdsale for new purchases. Do I count the bonuses I will receive in the transaction that should tip me over the Million+ Tier eligibility threshold? 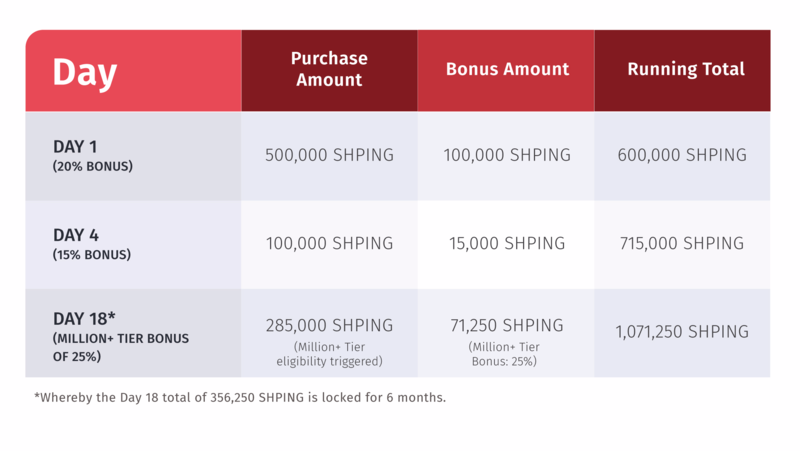 As bonuses are awarded after a purchase, you will not be able to include the bonuses that you are going to receive as part of the final transaction to take you over the 1 million SHPING eligibility threshold. Our Token Cart will automatically alert you to how much you will need to meet the threshold and when you have met the eligibility requirements. Do I have to buy 1 million SHPING in one lump sum, or can I build up to the eligibility threshold by buying in lots during the Crowdsale? Can I use the bounty rewards as part of the 1 million SHPING eligibility threshold? No. Bounties are awarded after the Token Sale has concluded. Can I use the coins I have accumulated in my Shping App account towards the 1 Million SHPING eligibility threshold? As these coins have been issued from the Shping App Incentive Reserve, they are not able to be counted as part of the 1 milliion SHPING eligibility threshold. I have a referral link. Can I still use this to receive an extra 5% bonus on top of the Million+ Tier Bonus? Yes. The referral bonus is applicable to any current bonus offer available during the Token Sale, including the Million+ Tier Bonus. Are Presale tokens affected or locked into the vesting period? No. Presale tokens are not affected or locked into the vesting period. What about the other bonuses advertised for the Crowdsale? The Day 1 and weekly bonus offers advertised during the Crowdsale will still remain in place for you to take advantage of. Can I purchase more coins to reach the 1 million eligibility threshold and get the platinum status for life bonus? Yes. This is a great way for those who wanted to receive Platinum Status for Life during the Presale to upgrade for even more benefits. You must first top up your account by purchasing enough coins to meet the 1 million eligibility threshold, before you will receive the 25% bonus coins and Platinum Status for Life. We have attempted to introduce this vesting period for the betterment of the community and long-term health of the project, and to minimise disruptions to token holders and prospective buyers. The Million+ Tier Bonus was introduced today (the 16th of February) and did not form part of the original whitepaper; the whitepaper and website has now been amended and we encourage you to read the full updates on page 30 here. For more information, download our updated whitepaper. For any questions, please chat with us on Telegram.